Long day! We got to celebrate a cousin's college graduation with some extended family and have four generations under one roof. But that kind of family time and celebrating required me to step back from the computer. I needed to be unplugged today!! And it felt great. But would not have been possible without Kara! I am super excited to have her sharing her outdoor play activity with us. If you haven't stopped by her site you must head over there and check it out, she has some AMAZING preschool play and learning ideas to share. So, without further introduction...take it away Kara! Thank you Abbie for inviting me to post here on Greening Sam and Avery. 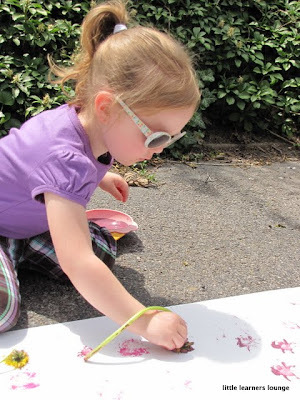 My name is Kara and I have a little preschool activity blog called Little Learners Lounge. Like Sam and Avery, my daughter Eva loves dandelions! Luckily our neighbor thinks they look great on her lawn so we have plenty to pick (I'm with Abbie- I pull ours as soon as I see them sprouting). I was looking at a lovely bunch that Eva picked for me the other day and realized dandelions would make great paintbrushes! Before heading outside Eva selected two colors of paint, squirted them in bowls and grabbed a roll of paper. Once outside, Eva set off to collect some dandelions. Then the fun began! Eva discovered that dandelions are perfect for dabbing with and she covered the paper with blossom stamps. We also tried painting with a bunch of flowers and got some great results from that too. Eva decided that her picture needed a track as well (she's on a little bit of a train kick these days) so she figured out how to drag a dandelion along the paper to make a lovely track. This was such a fun, open ended activity. We even washed the dandelions when we were done because Eva was concerned the bees wouldn't be able to eat them if they had paint on them. Turns out weeds can be wonderful!